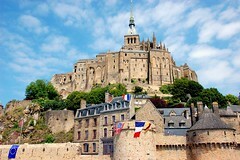 I’m up early this morning, getting ready for a day trip to nearby Mont-St-Michel, which I’ve been told is the second most visited tourist attraction in all of France, after the Eiffel Tower, with three and a half million visitors per year. I shudder to think how many will be there today, given the beautiful weather outside the window. The Hotel Churchill operates a daily shuttle to Mont-St-Michel, so by 9:30 I’m resting comfortably in the front seat of an air conditioned minivan next to Sabrina, our driver, with a couple from Wichita, Kansas and a businessman from Montreal in back. At 50€ each for a round-trip fare, it’s an expensive option, but with few trains and poor connections between Bayeux, Pontorson, and the Mont, it’s wonderfully convenient. The landscape around us is mainly flat, so though we are still miles away, it’s not long before we spot Mont-St-Michel in the distance, offering the profile of a ragged mountain rising out of the horizon. Sabrina pulls the van off the side of the road so that we can snap pictures. As we drive in along the causeway, she recounts the legend of St. Michael the Archangel appearing in a dream to the local bishop in the year 708. The angel had instructed the bishop to build a chapel on a rocky island at the mouth of the river near Avranches, but the bishop ignored the command once, and then twice. On the third night the nocturnal visitor came again, this time pressing his finger to the bishops’ skull, burning a hole in the side of his head. Not surprisingly, the incident turned the man’s skepticism into profound—if terrified—belief and led him to begin work on an abbey in honor of the saint. Today, the abbey and its cloisters, topped by a tall gothic spire, perch high on the rock, surrounded by gardens and medieval fortifications. 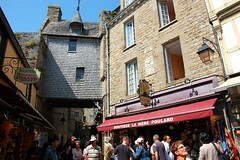 At the base is a small village, with shops and houses dating from the 15th and 16th centuries along a narrow and winding lane optimistically titled the Grand Rue. As we pull into the car park, we can hear the sounds of military bands playing in tribute to the week’s 65th anniversary of the D-Day invasion. It’s a painfully tight schedule, with just three hours to visit the church, the town, and the surrounding tidal basin, so together we make haste up the long, steep hill, intending to start from the top and work our way down. 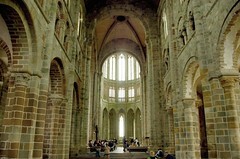 The abbey church is stark and bare, constructed of honey-colored stone. The 11th century nave and transept are Romanesque, but the choir, built several centuries later, is thoroughly Gothic, with tall pointed arches and matching windows above, supported by flying buttresses on the outside. From here, the audio guide I rented takes me to the cloister, and then through a long series of stairways, corridors, and rooms, including a chapter house and refectory. It’s a mammoth complex, and its construction over time has a higgledy-piggledy quality that reminds me of being in a maze. 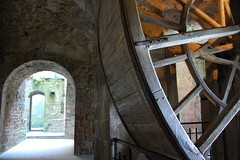 Indeed, when I arrive at a room with a large wooden wheel, attached to ropes and pulleys, that was once used to haul goods from the base of the Mont, I imagine a hamster wheel enlarged to comical proportions, although here I’m told that it was propelled by prisoners… very unfortunate prisoners from the appearance of it! I’ve had a brilliant time exploring, but I am beginning to feel desperate for the exit. It’s midday and my foot is throbbing. 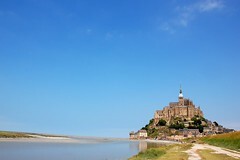 Between the drive to Mont-St-Michel and the long journey through the abbey, I haven’t been able to take any ibuprofen. 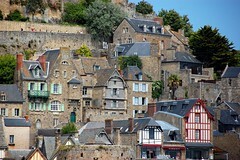 I make my way out along the ramparts and the down through the village, stopping for a bottle of water to take my pills. I decide, too, to snack on a regional specialty, the Galette Bretonne. It’s a thick and slightly sweet butter biscuit, similar to shortbread. It has a nice flavor, but it crumbles easily and makes something of a mess. The village is thick with tourists by now and the shops along the Grand Rue provide a veritable gauntlet of overpriced souvenirs—postcards and key chains, placemats and shot glasses. For a moment, I stand outside the window of La Mère Poulard to watch them make omelets, rhythmically whipping the eggs to a froth in a giant copper bowl. But instead of lingering further in town, I decide to make my way out through the massive King’s Gate, back to the causeway and to the beach and bay beyond. It’s low tide, so the sea has receded enough to walk safely (for now) out into the sandbanks surrounding the island. The day is cool and breezy and when 1:30 comes, I regret having to leave so soon. Back in Bayeux, I have a few hours to spare before my train back to Paris. I rest for a bit and then take a final stroll through the town, stopping to eat and to buy a small bottle of Calvados to take home. The journey back is quiet and relaxing, alone in a private compartment with plush gray seats that reminds me of the train Harry Potter takes to Hogwarts. By 9:00 PM, we pull into Gare Saint-Lazare, and I have only the metro ride home, with a pesky change of line at Châtelet. The Rue Mouffetard is growing dark and the bed in “My Little Home in Paris,” just around the corner, beckons.